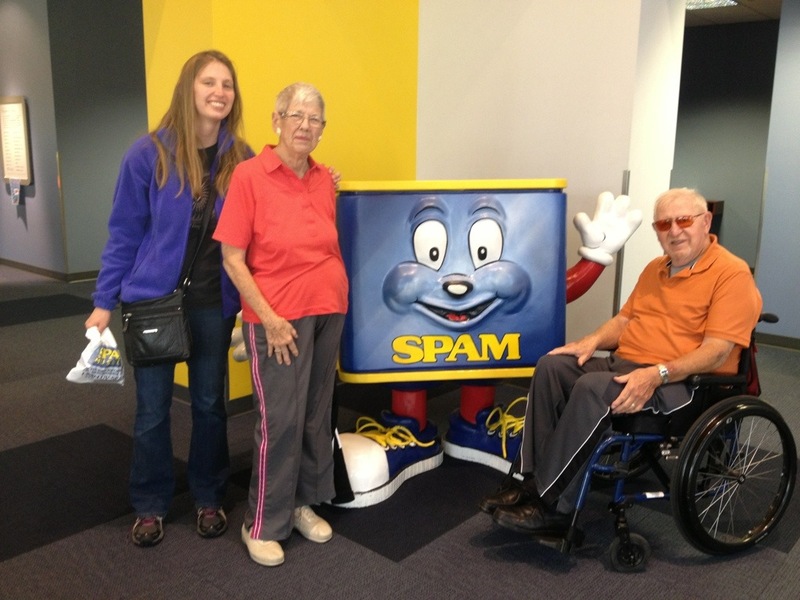 But last week, my grandparents came and they thought the Spam museum sounded like fun. So we made the 45 minute trek to Austin, MN to Hormel’s free and very interactive SPAM museum. We walked into the fabulous blue and yellow building and found… a great museum! A wall of SPAM cans, a movie about the history and marketing of the product (it really is pork and ham! ), a cooking corner with chefs from around the world preparing the product, a place to try on the heavy metal mesh gloves that factory workers wear… Pretty fun! Plus it pulled up some great memories. My grandparents reminisced about eating fried spam during the war days when the meat was rationed and my grandmother recalled her mother heating up Dinty Moore stew. I really enjoyed this visit. Whether you love it or loathe it, spam is part of our American food ways. So don’t be a judger. Put on your cultural relativism hat and give it a try! Note: they do have lite, reduced sodium and turkey spam for those of you who want to be a little healthier. For the gourmands there are garlic, black pepper, jalapeño, bacon and probably many more.